Aluminum is the most plentiful metal on earth. It is lightweight and inexpensive and more than likely you have things made of this metal in your home and don’t even realize it. Aluminum on its own is too malleable, so it is often mixed with other metals. Aluminum pots and pans will often start to look dirty because oxide forms rather quickly. Even when you clean it off it will come back, so keeping your aluminum cookware clean will be a constant process. Oxidization changes the aluminum from shiny silver to a dull gray. So how do you clean aluminum that is softer than other metals and oxidizes quickly? The first step is to wash your aluminum pots and pans in hot water. If your aluminum has a layer of grease or oil on it you want to get this off completely. If you don’t remove all of the grease it will make cleaning the oxidization off of the aluminum impossible. Using a sponge with a scrubbing side or a soft brillo pad will help to remove any stubborn oil or grease. Don’t use steel wool as this will just leave your aluminum riddled with scratches. 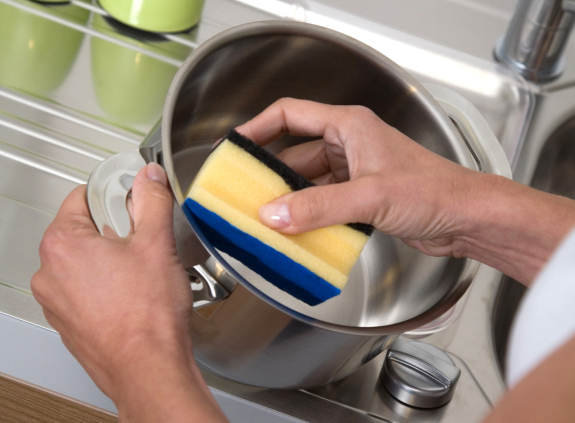 A sponge with a scrubbing side should be more than enough to get rid of the grease. If you are cleaning a pot or pan that has burnt food or scorch marks on the bottom that won’t come off with scrubbing all hope is not lost. Take the pot or pan and put in a small amount of water. Bring that water to a boil and use a spatula to try and scrape the burnt food off. If this does not work adding cream of tartar to the water and letting it boil for five to ten minutes should do the trick. You can remove aluminum tarnish with acid. Avoid the dangerous strong acid and opt for something simpler; like lemon and vinegar. Add water, vinegar, and whole lemon sliced up to your pot and heat it until boiling. Let it continue on the heat for up to twenty minutes. This will do wonders for your pots and pans and the best part is that the ingredients are all natural. Another natural cleaning method is to take a lemon slice and dip it in salt. Use the salted side of the lemon to scrub the pot or pan to remove oxidation. When you are finished make sure to rinse and wash the item completely to remove any lemon or salt residue. With all of the above methods it is important to dry your aluminum completely once you are done cleaning it. This will help it to stay clean and without oxidation for much longer. Leaving an aluminum pot or pan sitting in water might seem like a good idea, but it only causes more issues for your cookware. It is better to clean it right away, get it dry, and put it away.